Are you a fan of shish kebab? 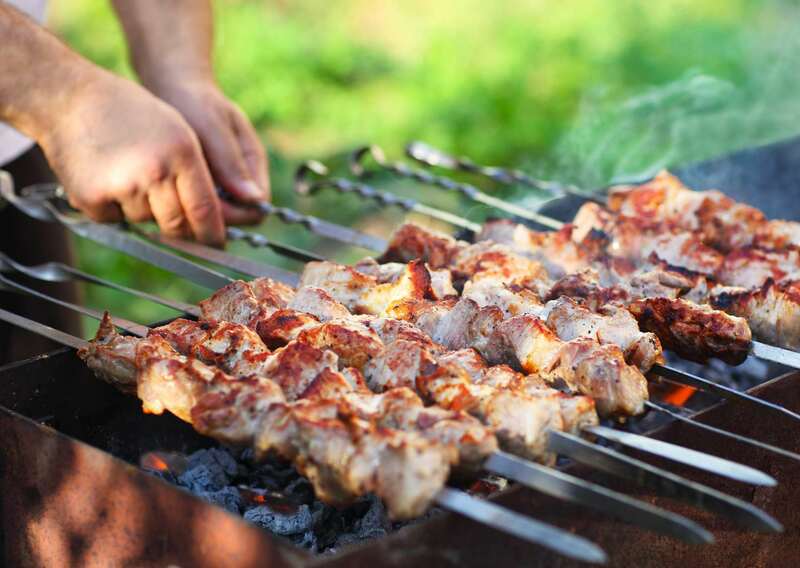 Did you know that Turkish cuisine is known not only for introducing the world to shish kebab but for all of its delicious grilled meats and kebabs? Some of the world's best and spiciest kebabs come from Turkey's southeastern provinces. People travel here from all over the world to sample them firsthand. We're all most familiar with the classic shish kebab. In Turkish cuisine, 'şiş' (SHEESH') refers to the metal skewer the meat is laced on. Chunks of marinated lamb or beef are placed on the skewers, usually without vegetables, and turned over a coal fire until they're done. Adana kebabı (ah-DAH'-nah keh-BOB'-uh) is the signature dish named after one of Turkey's most famous "kebab cities," Adana. This dish is made with ground beef or a mixture of ground beef and lamb kneaded together with onion, garlic, and Turkish spices, then packed by hand around large, flat metal skewers. When the kebabs are placed on the grill, the fat drips from the meat causing it to bind together. It forms a long, hollow tube of cooked meat once the skewer is removed. Adana is very spicy. Generous amounts of hot red pepper flakes and paprika are kneaded into the meat mixture giving it a deep red color and fiery flavor. It is usually served with grilled vegetables like hot green chili peppers, onions and tomatoes, and a hearty bulgur and vegetable pilaf. Another popular kebab is the cousin of Adana kebab. Named after the city of Urfa, Urfa kebab is prepared in nearly the same fashion as Adana minus the heat. Urfa has a mild flavor seasoned with onions, garlic, cumin, oregano and sweet paprika kneaded into the meat. It becomes tender and juicy letting the flavor of the meat shine through. Another favorite from the grill is called 'çöp şiş' (CHOPE' SHISH'), which literally translates as 'shish made of garbage.' However, it's anything but garbage. Çöp şiş is actually lamb scraps and fat, the "garbage" left over when trimming perfectly symmetrical cubes of meat for a classic shish kebab. These small bits of boneless meat are pounded together with garlic and tomato, then left to marinate in a mixture of black pepper, oregano and olive oil. Once placed on small wooden skewers, the bits are thrown on the hot grill along with the other kebabs. The tiny pieces of meat brown quickly to perfection and the pieces of fat become crispy and add extra flavor. Çöp şiş is often treated like an appetizer, served before the main kebab meal. It whets the palate and prepares the stomach for larger things to come. Döner kebabı (done-EYR' keh-BOB'-uh), or turning kebab, is a popular Turkish street food from which the Greek gyro and Arabic shawarma were derived. But in Turkey, the meat is leaner, and it's served much browner and crisper. Shavings of turning kebab are usually eaten plain over a bed of rice or wrapped in a soft tortilla made from durum wheat flour, called durum (doo-ROOM'). This kebab originated not in the deep southeast, but in Bursa, a city just south of Istanbul and the first capital of the Ottoman Empire. Turning kebab was hung horizontally and cooked over coals similar to the way it's done further East. One day, İskender Efendi, who lived in Bursa sometime back in the 1800s, decided to invent a special grill to roast meats vertically. This new invention allowed the meat to be rotated and shaved off simultaneously. Thus, modern turning kebab was born. Iskender kebabı (iss-ken-DEYR' keh-BOB'-uh), another popular kebab dish from Bursa, is named after Iskender Efendi himself. Crispy shavings of döner are laid upon a loaf of tender, flat pide bread, similar to pita, that's been cut into small squares. The entire dish is doused with melted butter, creamy yogurt, and a tangy tomato sauce. Authentic Iskender kebabı is still served in Bursa, as well as across Turkey in a chain of restaurants named after Iskender Efendi himself. Coming in a close second to Iskender kebabi in terms of popularity is Polite Ali kebab, better known as alinazik kebabı (ah-KEE'-nah-ZEEK' keh-BOB'-uh). This succulent classic is a combination of marinated, grilled lamb served over a bed of warm, fire-roasted eggplant mixed with plain yogurt. If you're an eggplant lover, this dish is for you. The smoky flavor of the roasted eggplant really enhances the taste of the grilled lamb. Another popular kebab featuring eggplant, this time, Turkish meatballs, called 'köfte' are sandwiched between layers of sliced eggplant brushed with olive oil. 'Tavuk' (tah-VOOK') or 'piliç' (pee-LEECH') shish kebab is made with either breast meat or dark meat marinated first in milk or plain yoğurt, then in olive oil and spices. A spicier version is coated with seasoned red pepper paste. Beyti is a recipe said to date back to Ottoman times. It was rediscovered by a famous Istanbul restaurant with the same name and is now popular all over the country. A mixture of perfectly seasoned ground beef and lamb rolled in a thin flour tortilla-like dough called yufka. It's then sliced into rounds and put on the skewer to grill.